Photographed plastered blocking in west wall of chamber. 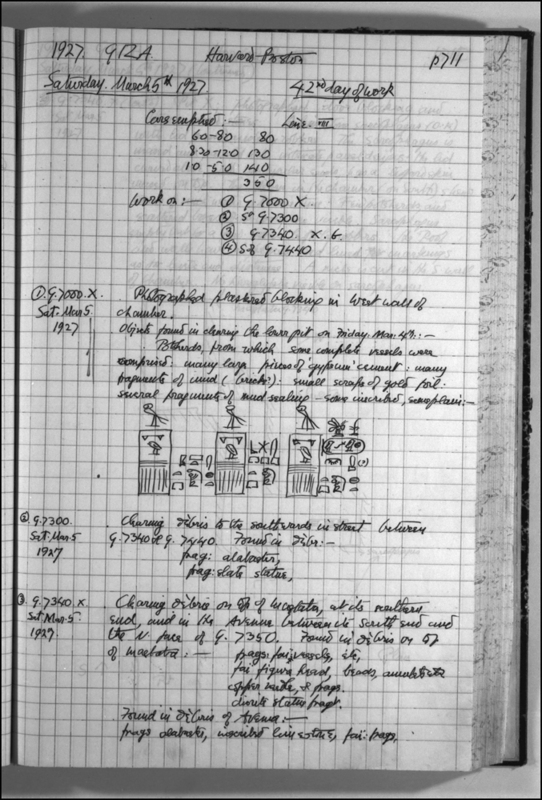 Objects found in clearing the lower pit on Friday, March 4, 1927: potsherds, from which some complete vessels were comprised, many large pieces of 'gypsum' cement, many fragments of mud (brick), small scraps of gold foil, several fragments of mud sealing, some inscribed, some plain. Clearing debris to the southwards in street between G 7340 and G 7440. Found in debris: fragment of alabaster, fragment of slate statue. Clearing debris on top of mastaba, at its southern end and in the avenue [avenue G 4] between its south end and the north face of G 7350. Found in debris on top of mastaba: fragments of faience vessels, etc., faience figure head, beads, amulets, etc., copper needle, and fragments, diorite statue fragment. Found in debris of avenue: fragments of alabaster, inscribed limestone, faience fragments. Junker, Hermann. <I>Gîza 8. Der Ostabschnitt des Westfriedhofs, </I>Zweiter Teil. Bericht über die von der Akademie der Wissenschaften in Wien auf gemeinsame Kosten mit Dr. Wilhelm Pelizaeus unternommenen Grabungen auf dem Friedhof des Alten Reiches bei den Pyramiden von Giza. Akademie der Wissenschaften in Wien Philosophisch-historische Klasse Denkschriften 73, Abhandlung 1. Vienna: Rudolph M. Rohrer, 1947.